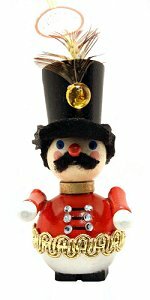 Steinbach Ornaments that depict the key characters from Tchaikovsky's Nutcracker Ballet. dreams of a Nutcracker Prince and a fierce battle against a Mouse King with seven heads. reflects more of what we have come to love as the Nutcracker Ballet. From the Nutcracker Ballet, we have the uncle with a questionable dark side, who gives Clara her nutcracker as a gift. Christian Steinbach has captured this key character as a wooden ornament. Made in Germany by Steinbach Volkskunst GmbH Marienberg, OT Gebirge, Saxony 3 Inches - 7,6 cm (Ornament may differ slightly from image) Sorry - Currently Out of Stock Back in Stock - later in 2019! In ETA Hoffmann's book, Marie is renamed Klara or Clara for the ballet, first performed in 1891 at the Imperial Theater of St. Petersburg. Christian Steinbach has captured this key character as a wooden ornament. Collectors Note: A second "Clara" was released in 2013, KAZ396 - this is the original ornament for this series. Made in Germany - Made in Germany by Steinbach Volkskunst GmbH Marienberg, OT Gebirge, Saxony 3 Inches - 7,6 cm Sorry - Currently Out of Stock Back in Stock - later in 2019! In the third act of the ballet, the Sugar Plum Fairy dances in the Land of the Sweets. The twinkling melody for this is played on a celesta. Tchaikovsky discovered the celesta on a trip to Paris, and was the first composer to use it in a ballet. Christian Steinbach has captured this key character as a wooden ornament. Made in Germany - Made in Germany by Steinbach Volkskunst GmbH Marienberg, OT Gebirge, Saxony 3 Inches - 7,6 cm Sorry - Currently Out of Stock Back in Stock - later in 2019!